Street food on Kaisermarkt is worth trying! If you are coming to Frankfurt, sooner or later you will end up at the main train station. Just a few meters from there you can visit the Kaisermarkt where you can try the German and international food and drink specialities! 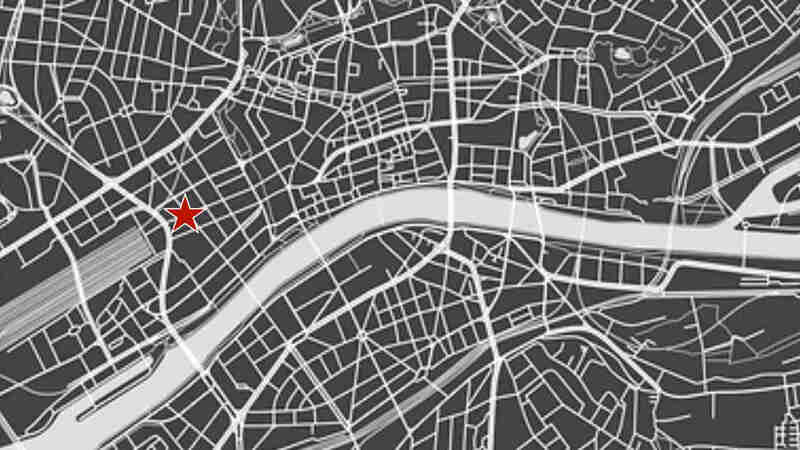 This week we will show you what we have eaten at Kaisermarkt in Frankfurt. There is nothing more traditional than Green Sauce in Frankfurt! Green Sauce has been known in Europe for ages. In Frankfurt, the first printed recipe was discovered in the cookbook written by Wilhelmina Rüdings. We are not sure where the recipe originally came from, but very probably from Italy. 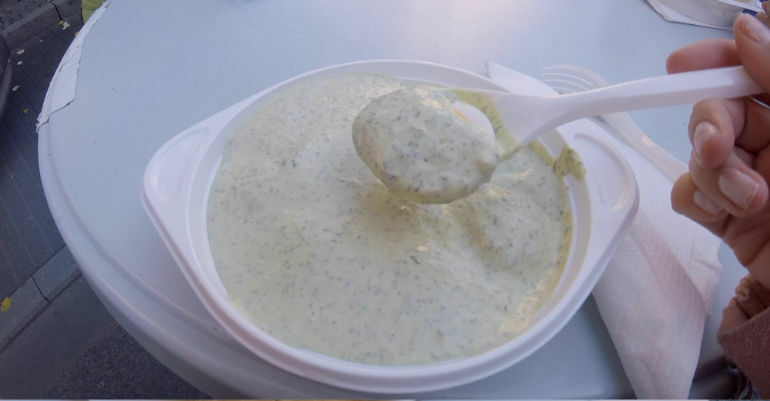 The green sauce is one of the most famous Frankfurt speciality that must contain seven herbs: borage, cress, chervil, parsley, burnet, sorrel and chives. Other ingredients that the real Frankfurt Green Sauce contains are sour cream, eggs, lemon, sugar and salt. Gisela Pauls Green sauce is prepared traditionally and it certainly tastes like it supposed to! Vendor: I will check for you! 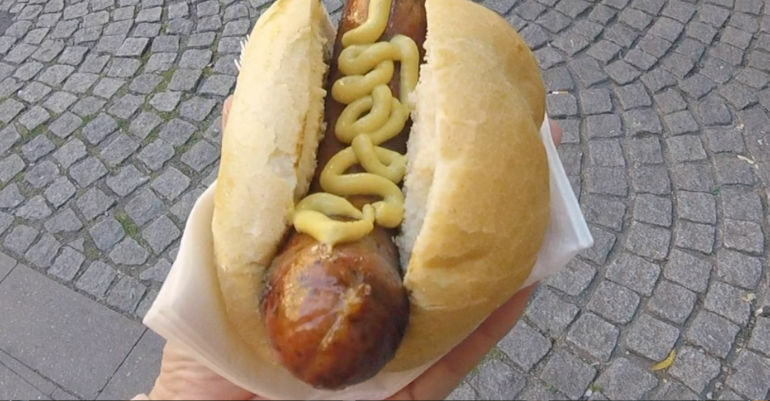 There is nothing more German than a bratwurst, I think you would agree with me on that! Most importantly – this bratwurst was extremely delicious! It is made from wild meat and if you already have read my previous posts and watched my videos then you know how crazy I am about wild meat! The Bratwurst was just perfect – I love when I feel the bigger chunks of meat and spices in the sausage and that was here exactly the case. This vendor is here only on Tuesdays as far as I have seen, so please be aware of that! Flammkuchen means flame cake which translates as “pie baked in the flames“. 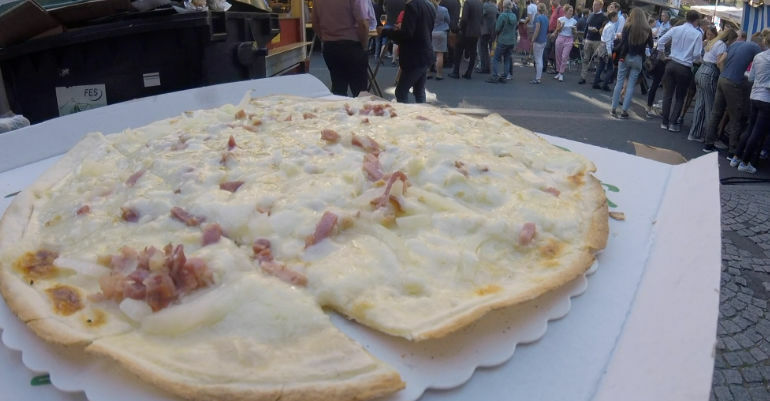 Tarte flambée is a speciality from northeast France and southwest Germany. It is made of bread dough rolled out very thinly and covered with creme fraiche, thinly sliced onions, lardons and in this case also with Bergkäse – cheese from German Alps. 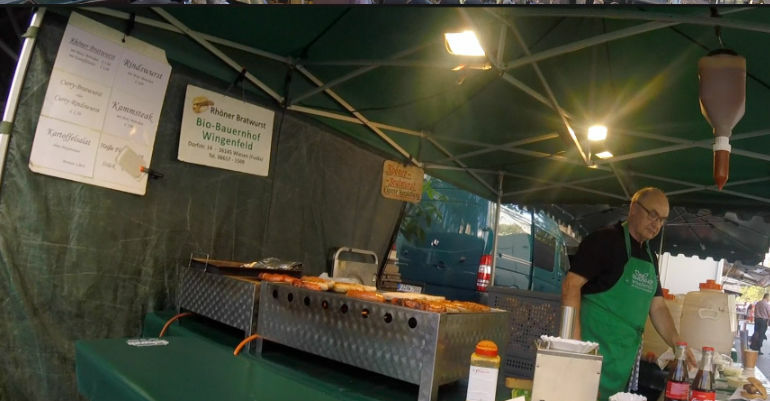 This vendor comes from Rhön and this is an area located between Bavaria, Hesse and Thuringia. That was another tasty bratwurst! The sausage is very well seasoned – if you like this, that’s the one to go for! The name of the last vendor I decided to try is Feinkost Paradies. The reason is that there is a non-stop queue from 12:00 until 14:00. I decided to go there and ask what do they sell the most. This turned up to be Mediterranean Bread number 1 (vegetarian) or 2 (with prawns or seafood). I went for the second option with prawns and I watched him with open mouth how he prepared my bread. I was thinking “what? did he really put those prawns marinated in yoghurt on the bread and then gill? how can this be any good?. It was. 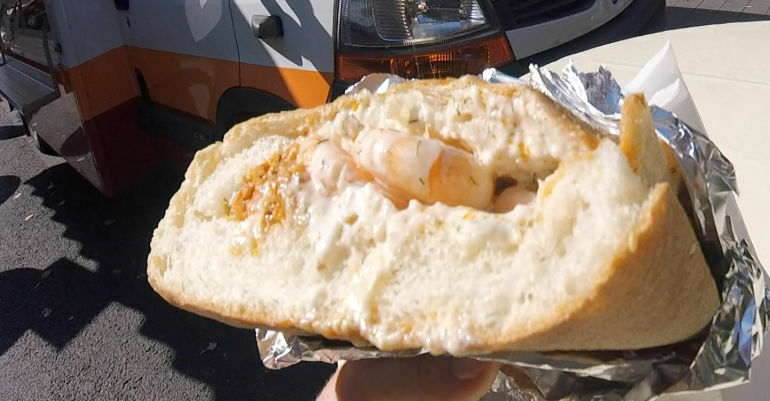 The salads, mozzarella and prawns in a bread went really well together. Maybe it is a time for us to cook more Mediterranean food from now on. I can recommend them fully!